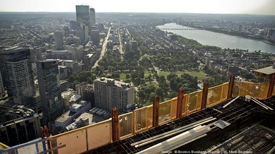 Boston is clearly seeing a tremendous amount of new construction from office to multi-family in all areas of the city. Once you dig deeper into the numbers you come to realize that the height of the vast majority of new projects doesn’t exceed 200 – 300 feet. 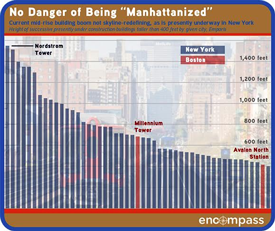 The exceptions are 1 Dalton and Millennium Tower at 700 feet and 690 feet, respectively. 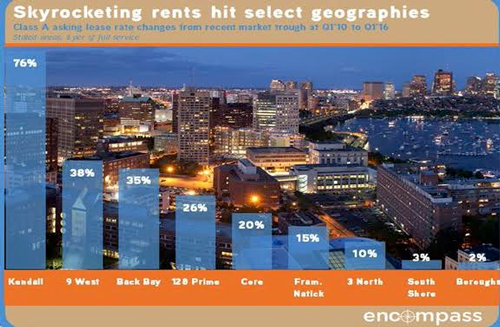 Boston developers instead are building what the market wants at a price point the market can support. Some of the challenges with going about 300 feet requires an additional elevator core which increases the add on factor. You can read the full article on B&T’s website. New England’s tallest building has space for you. The tower has approximately 450,000 square feet available for lease. Rents at the top of the tower run $70 to $80 per square foot — among the priciest in town. Boston Properties has given no sign it plans to offer discounts to fill 450,000 vacant square feet. Still, the slowdown reflects a bit of a softening at the very top of Boston’s market. 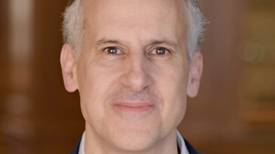 Real estate brokers say law firms, financiers, and others who seek trophy office space are pushing back against building owners who want to hike rents. You can read the full Globe article, here. 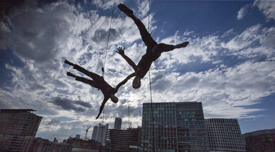 Joe Fallon’s 100 Northern Ave. in the Seaport is preparing for a launch party different then we have seen before: vertical dance. Boston’s Seaport is one of the country’s hottest submarkets with office tower trades in excess of $1,000 per square foot and the new world headquarters to GE. Boston beat out the Bay area for the highest rated CEO according to Glassdoor. Google moves to 7th place as Bain takes the 1st place spot. 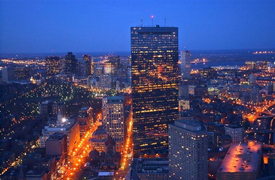 Boston is home to long-haul, nonstop daily flights to Shanghai and Beijing. 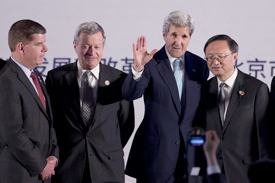 In addition, Boston will host the U.S. / China Climate summit in 2017. Boston won’t be scaling up to the development heights of projects underway in NYC. Boston’s newest tower comes in at nearly half the height of New York’s Nordstrom Tower. 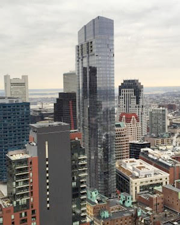 When comparing to New York’s major projects under development, Boston comes up very short with Millennium Tower as its tallest, versus Nordstrom Tower, by more than double its size. Nordstrom Tower (when complete) is set to be crowned the World’s tallest, towering in at 1,775 Feet, while Millennium will top off at 685 feet. 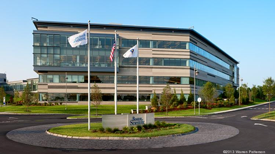 Massachusetts is on the march up the fortune 500 list with all but 12 of the companies advancing from their standing last year. The list next year will add GE, which placed 11th on the current list. Again leading the way in Massachusetts was Boston-based insurance giant Liberty Mutual, which rose to No. 73 on the list after finishing No. 78 last year. Springfield’s MassMutual jumped nearly 20 spots on the list to No. 76, and this year Framingham-based retailer TJX (NYSE: TJX) entered the Fortune 100, coming in at No. 89 after ranking No. 103 last year. Daily garage parking in Boston’s urban core is some of the most expensive in the country. Combine that with our tight office market, and you have a swell of new opportunities across the city. 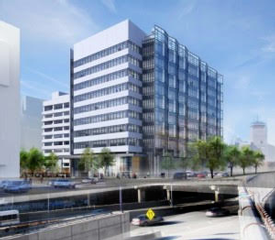 The proposal brought forth by Nordblom is a 230K SF building atop 321 Harrison Avenue. Designed by SMMA of Cambridge, the office building would be built of insulated glass in a metal panel system with some curtain walls with floor-to-ceiling glazing. The building will have sweeping views of the Financial District and Back Bay and be designed with totally open floor plates with “exceptional” ceiling heights, said Og Hunnewell, a partner with Nordblom Co. The ground floor would include cultural or gallery space at the corner of Herald Street and Harrison Avenue. Copley Wolff Design Group is the landscape architect. Open space is planned next to 1000 Washington St., an 11-story, 234,900-square-foot office building that shares the site and will be retained. Nordblom estimates the project would create 1,500 permanent jobs.